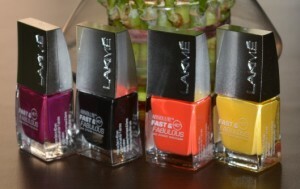 Hi Everyone, I’m here again with another review, this time I’m reviewing Lakme’s new range of Fast and Fabulous Nail Colours. I’m very fond of nail paints specially the bright colors and I ordered some random shades from this range and fell in love with some of the colors. My Experience : I find these nail paints very useful as they dry quickly, so you don’t have to wait for them to dry. They sets into semi-matte which is perfect for any occasion. Wide range of color options are available to choose from. 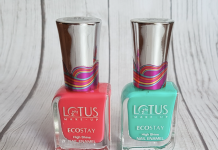 You can buy these beautiful nail paint online and get exciting offers. 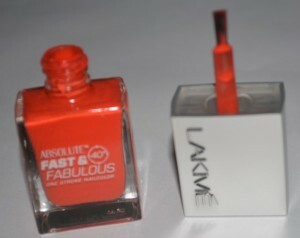 Lakme Fast and Fabulous Flaming orange : If you are looking for deep orange color then you should go for the 13 number shade called Lakme Fast and Fabulous Flaming orange. With only one stroke it will give you a nice orange colour but if you are looking for really deep orange then two strokes will work for you. It will cost you Rs.199 for 10ml. Lakme Fast and Fabulous Sunshine Yellow : If you are Looking for some lively, bright and funky color then you cannot miss the Sunshine Yellow shade. It is the number 30 on the shade card and can compliment your look any day. It will cost you Rs.175 for 10ml. Lakme Fast and Fabulous Puple Fix : Another beautiful shade of Lakme’s Fast and Fabulous nail colors for all who love Pink and Purple is number 9 Purple Fix. It is a beautiful purple color with a tint of pink in it. With the first stroke you will get a nice subtle purple shade with a little glossy finish and a slight pink touch and with the second stroke it becomes more dark and turn into a eye-catching purple. It will cost you Rs.175 for 10ml. 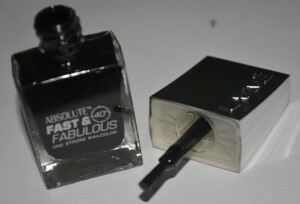 Lakme Fast and Fabulous Night Desire : And last but not the least every girl’s favorite number 3 Night Desire i.e, Black color. You can flaunt your nails with Black nail paint anytime, anywhere and with any outfit. It will cost you Rs.200 for 10ml . Usage : These nail colors comes in attractive transparent bottles that catches your eyes and they also look gorgeously beautiful in your dressing area. Colors are easily visible in see through bottles. It has a smart cap with applicator inside that has comparatively broad bristles for easy and even application of color on your nails. Just one stroke and you are done. 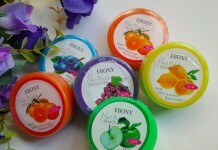 These colors are really long lasting as you can almost spent a week with the same application. going to compliment your casual and funky looks.